Have you ever thought of adding life to your years combined with adding years to your life? If you are like many, the answer is “Yes,” because you have many things you want to continue doing, and perhaps find activities and contributions you still desire to make. What is living cell therapy and what does it do for you? 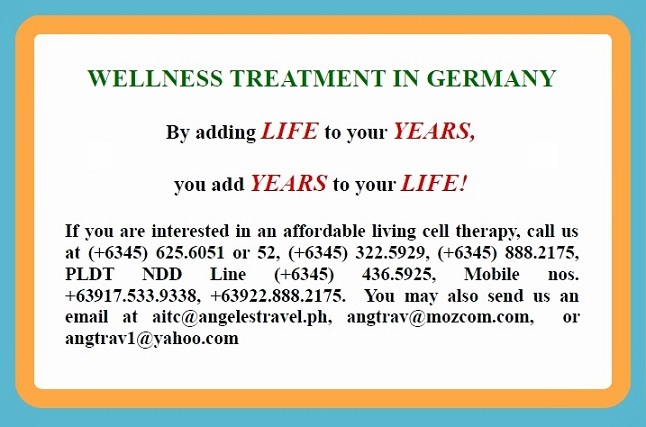 It is an ancient method, developed and made known worldwide by the famous modern live cell therapy Swiss doctor, Dr. Paul Niehans, 80 years ago. The treatment is a non-invasive approach to combat degenerative diseases and a remarkable way to modulate our aging process. The live cells are derived from unborn or young donor animals which are suspended in a natural solution and injected into the patient. These cells and their components allow defective cells in the human body to regenerate by supplying the patient’s ailing organ, or the aging organ as a whole.